Our new website features, for the first time, all the Rotarex Firetec products together in one place. It is easier to find the right products, with enhanced search ability and more detailed information, all in a modern, responsive design. Rotarex Firetec, a business unit of Rotarex SA, announced today the launch of its new, next-generation website. For the first time, Firetec Building and Room fire protection systems and FireDETEC Object Protection systems can be found in one website. 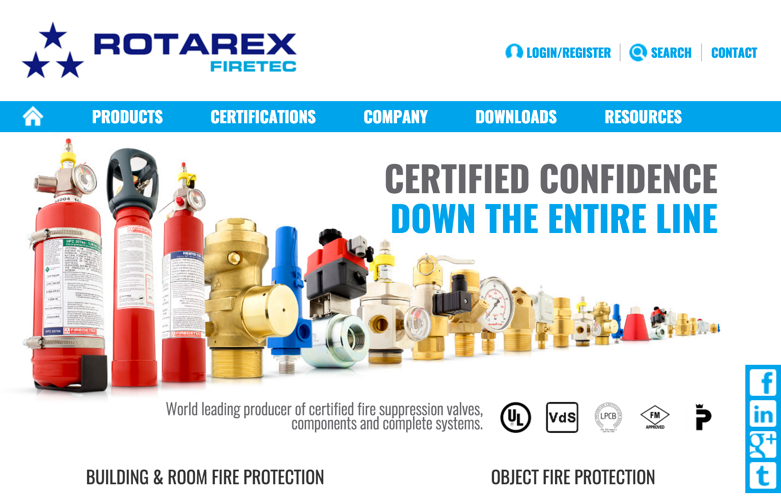 The site features a contemporary, intuitive design that provides users with easy access to Rotarex Firetec’s complete range of very high quality fire suppression valves, components and systems. Responsive design ensures excellent performance on all devices. The “Innovation” section of the website features many new innovations that are already making an impact on the fire protection industry, such as the DIMES digital measurement system. This product improves fire protection system readiness by monitoring fire suppression cylinder contents 24/7/365. On the new website, many catalogs, brochures and material safety data sheets are available for download. Plus, an interactive map makes it easy to find any of the numerous Rotarex service centers that support 65 countries. Distributors interested in including Rotarex Firetec or FireDETEC systems in their portfolio are invited to visit the “Become a Distributor” page for more information. Businesses, building owners, engineers and installers worldwide confidently choose Rotarex Firetec systems, components and accessories. We’ve become a world leader in fire suppression valves thanks to the expertise we’ve developed over 80 years and our enduring commitment to quality and technical excellence. Focused on innovation, we continue to develop breakthrough products that keep people, buildings and equipment safer from fire. And we create products and systems that improve productivity, require minimal maintenance and deliver outstanding ROI over time. You can find us in 65 countries and can count on us to provide responsive service. ©2016 Rotarex. All rights reserved. FireDETEC, Rotarex and their respective logos are trademarks or registered trademarks of Rotarex, SA. All other brand, service or product names are trademarks or registered trademarks of their respective companies or owners.